adore that focus fabric...so sweet...lovely colors. you are a quilt wizard! Can you tell us what that sweet birdie fabric is? I'd be perfect for a quilt I am planning for my 2year old. Thanks so much! the birds are pottery barn sheets (i bought a piece off ebay--not even the whole sheet). i saw this cute little quilt and went searching on ebay. (I also got some of the owls, which I love too). Adorable! I love those little birds in the center. Too cute. I love that bird fabric! Sheets! Amazing! so, so cute! I love those birds! Too Cute!! Love the little bird fabric. good use of the birdies! So sweet! I love the little birds fabric! This is so cute. I love when the fabric is the star of the quilt. Fabric like this has to be shown off and enjoyed! Wow, to think that I inspired a quilter as inspirational as you ... that's a great compliment. Thanks! PS. I like your bird fabric better than my owl fabric anyway! So cute! I love the center fabric. So cute!!! I love the birdie fabric, and that is so cool it is from a sheet. What a great idea! Can't wait to see it finished! I cant believe the bird fabric is a sheet! I never thought of that...what a great idea. Your quilt looks so yummy. I really cant wait to see it with the binding...i love it! Oh my, they are all wonderful! Love your focus fabric for quilt #3very cute! 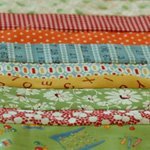 I already told you how much I love your Nest quilt and that Katie Jump Rope strip quilt, love it. I'm glad I'm not the only one that starts many before finishing a few. Thanks for sharing your pics & the inspiration. Oh what a darling quilt!! Is the bird fabric one of these Japanese imports!! I love it. So darn cute!!! I love the birdie fabric. Could you tell me what maker or line it came from? Those little birds are adorable. How are you going to quilt it? Ooooo! I feel not so crazy reading about your three quilts because last week I started two quilts and my family was raising its collective eyebrow. I'm loving the birdies along with everyone else. This quilt feels very fresh, along with your others. Oh nettie, your so clever. The birs are fantastic! Who would have thought... sheets! 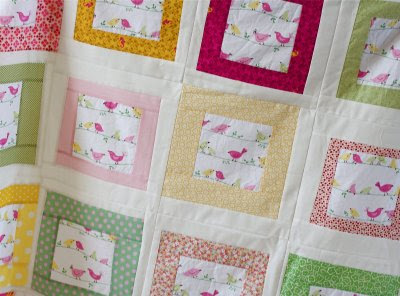 Love this birdie quilt! You always find the best fabrics!